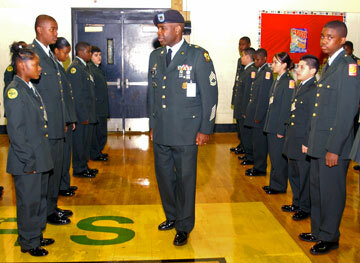 When Carver High School was converted into a military academy four years ago, Curtis Murphy, then the school’s principal, predicted it would become as prestigious as the Chicago Military Academy in Bronzeville, the district’s first. That prediction, however, has yet to be fulfilled. Unlike Bronzeville, a showpiece for Chicago Public Schools, Carver’s conversion came with scant resources and little support from central leadership. Since it opened in 2000, the school has had three principals, and it still seats a regular local school council, not the required board of governors whose membership would include military experts. Most of the pre-conversion faculty and staff remain and have not reapplied for their jobs like those at other converted schools. And test scores remain in the basement—Carver has been on academic probation since 1996. While Carver and Chicago Military both look for students who are willing to commit to stricter rules and regulations, Carver does not require students to be on grade level to be admitted; Chicago Military does. “The school is a military school in name only,” says Darryl Gibson, one of the school’s parent local school council members whose son is a senior at Carver; another son graduated in June. However, the appointment this summer of a new principal with military credentials has raised hopes that Carver’s sluggish conversion would finally gain traction. School officials say the school’s conversion is still underway, noting that instead of closing Carver, CPS opened up the military program to incoming freshmen while students enrolled in the old academic program were allowed to remain through graduation. Those students had been phased out by spring 2003, and by fall, Carver was a full-fledged military academy, at least in terms of enrollment. Since graduating its first military students in June, the School Board has replaced the principal with a new one who has a military background, something Carver’s last two administrators didn’t have. By next spring, they plan to appoint a board and determine whether staff will be required to reapply for their jobs. However, some loose ends remain, such as whether to change student admissions criteria. In fact, this year, school administrators are meeting regularly to develop standards for creating quality military schools citywide. Bronzeville was opened in 1999 to give parents another educational option that emphasized discipline and a more rigid structure than other high schools. Indeed, fewer than 10 percent of seniors who graduated in June from Chicago Military and Carver joined the military. However, far fewer Carver graduates go on to college and get scholarships to pay for it. However, unlike Chicago Military which started from scratch, building its program one grade at a time, Carver remained open and ran two separate academic programs for three years. “That first year, you could tell that this was something that was being tried and was not a finished project,” says Gibson. “You had people who were not experienced in military concepts. Chicago Military got seven times more money for its launch, $28 million compared to $4 million, but it had to convert an unoccupied armory into a fully equipped school. In 2002, Murphy retired and Assistant Principal William Johnson took his place. Then this past summer, Johnson was reassigned to Fenger, whose principal was removed this year because of the school’s poor academic performance. Carver’s newest principal, installed in August, is John Thomas, who has been an officer in the Army Reserves for eight years and was the former principal of Mose Vines Preparatory Academy, one of four small schools at the former Orr High School. Barron says one of the most dramatic changes since Thomas’ arrival was the implementarion of the military academy senior cadet leadership structure, which previously had existed only on paper. Under a military academy system, juniors and seniors earn rank and are placed into leadership roles that they begin working on as early as freshman year. Upperclassmen are responsible for disciplining students and overseeing building upkeep, for instance. In turn, underclassmen learn the ropes from their older peers. With the new leadership and structure in place, Pittman says selecting a board of governors is next. He expects the board to be seated by summer 2005. Members of the current local school council, which the board plans to disband, must apply for a seat on the board. However, one parent advocate says such a move is illegal, and asserts that the School Board has a history of creating policies that break the law but suit their needs. “We don’t think this is legal,” says Julie Woestehoff, director of Parents United for Responsible Education (PURE). Exceptions to the state law that requires electing local school councils—small schools or alternative schools like military academies, for instance—do not apply to schools that have a current LSC, she says. Also, faculty, most of whom were on board prior to Carver’s conversion, may be required to reapply for their jobs next spring, says Pittman. So far, there has been no discussion about what staff qualifications would be required, or if under the existing teachers union contract, it would be even possible to make faculty reapply. At Chicago Military, Principal Richard Gray says its teacher qualifications are much like any other high school; it wants good, qualified teachers. Thomas, in the meantime, will have to work on boosting students’ scores. His plan is to focus in improving instruction and providing students with additional services such as after-school tutoring. He also hopes students will take more responsibility themselves. At the district level, area instructional officers, principals and central office staff are meeting monthly to develop academic and operational standards for military academies. Besides Carver and Chicago Military, there are nine other high schools with military programs open now, and one full-fledged Naval Academy in the works at Senn High School. “We’ll look at the acceptance procedure, what should be required of students and whether all the military schools receive the same resources and are supported in the same way,” says Barron. To contact Debra Williams, call (312) 673-3873 or send an e-mail to williams@catalyst-chicago.org.